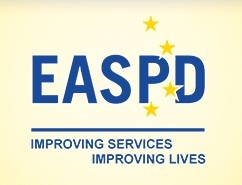 EASPD — Spe­cial Newslet­ter Ear­ly Child­hood Inter­ven­tion | EURLYAID - E.A.E.C.I. In order to achieve a tru­ly inclu­sive soci­ety, per­sons with dis­abil­i­ties have to be includ­ed in every step of their lives. From the very ear­ly stages of life, we must build on the capa­bil­i­ties, skills and resources of every per­son and their fam­i­lies and pro­vide real equal oppor­tu­ni­ties for all. This is why EASPD has been work­ing on ear­ly child­hood inter­ven­tion as a pri­or­i­ty and has devel­oped this spe­cial newslet­ter in col­lab­o­ra­tion with Eurlyaid.